She picked up then hugged Chocolate, her dark brown fluffy cat and hugged her. Chocolate was wearing a Christmas collar with red mice and holly leaves all round it. Ferne was wearing a special Christmas jumper her mother had finished knitting it for her only last week. It was in scarlet red wool with a high roll neck. Patterns of reindeer raced round the yoke. Red was her favourite colour. Chocolate wriggled her whiskers, purred and pushed her wet nose into Ferne’s cheek. “I love Christmas trees, Christmas cards, Christmas candles, Christmas carols, Christmas presents, Christmas snow, Christmas dinner and I love Christmas Chocolate,” chanted Ferne laughing. “Don’t you love Christmas, Frankie?” Her elder sister was sitting at the kitchen table writing a list of people to send cards to. Ferne’s mother was looking in the cupboard under the stairs. It was where she put all the tree decorations in bags when the Christmas tree was taken down. Ferne opened the bottom drawer. Chocolate started scrabbling in the drawer with her paws. A large spider jumped out over the side and ran to hide under the washing machine. Chocolate chased it. Ferne picked up the red and black torch and went into the hall. All she could see was her mother’s bottom. It was swaying from side to side as she bent double, trying to see in the gloom. “I've got the torch, Mum,” said Ferne. Ferne shone the torch. “Yes, there they are.” She grabbed the three carrier bags and dragged them out. Chocolate walked in from the kitchen, her tail waving high like a furry flag. “Are we getting the Christmas tree soon?” Ferne asked. That night Ferne couldn’t sleep. She opened the curtains in her bedroom. It was a full moon. The sky was clear, deep sapphire blue. Every star shone and glittered in the cold night air. Silver moonlight slanted across the bedroom and over Chocolate. She was curled in a crescent shape at the end of Ferne’s bed. She was on her paw print blanket. Feeling cold, Ferne put on her Christmas jumper over her pyjamas. Then she put on a long, multi-coloured scarf. Then she climbed back into bed. She picked up her Snow-Globe on her bedside table. It had been a present from Mr and Mrs Ball next door. She shook it. Moonlight reflected on the white and glitter snowflakes. 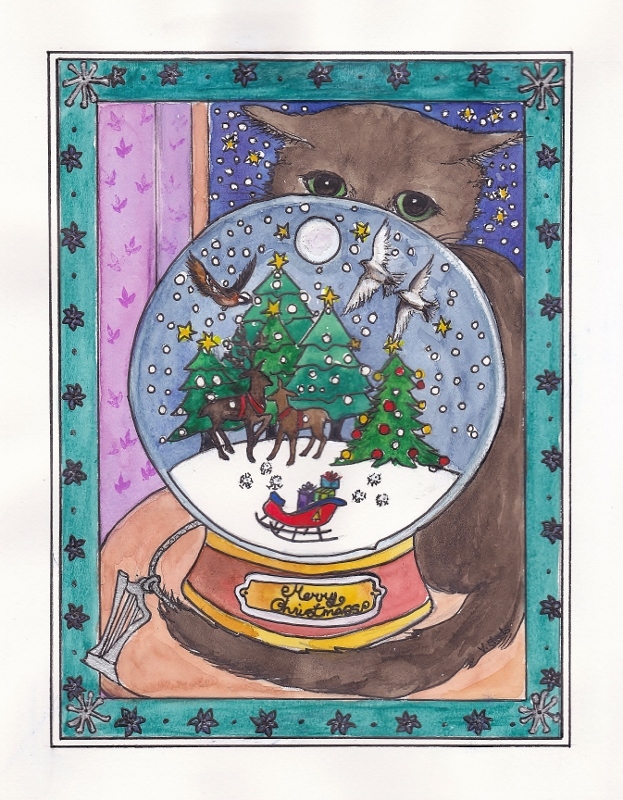 The reindeer in the middle of the glass globe were pulling a sleigh. There were fir trees with birds and baubles in their branches. Ferne shook the globe again. Chocolate stretched her back legs in ballet points. Then she crept up the bed and nestled beside Ferne. Ferne stood by the fir trees. She looked down and saw she had her red boots on. She wound her scarf round her neck. The snow was white and crisp. There were with no footprints in it. Shiny glitter baubles hung from the trees. Brightly coloured birds, like small parakeets flew from branch to branch. They were chattering, ready to roost. The moon was rising like a huge yellow medallion. Where was Chocolate? She was crouching, watching a bird that had fluttered down to the ground. Ferne clapped her hands and the bird flew back up into the nearest tree. “Chocolate, come here. I can hear something. It sounds like bells tinkling.” Chocolate tip-toed over to Ferne and stretched her front paws up Ferne’s leg. She could hear the bells too and wanted to be picked up. In the distance Ferne could make out a sleigh in the moonlight. As it came nearer she could see it was pulled by six brown reindeer. It was driven by a man with long golden hair. When it reached the clearing where Ferne and Chocolate were standing, the man pulled on the reins and shouted, “Hoya! Hoya!” The six reindeer stopped. The red, blue and gold sleigh slid to a standstill. “Who are you?” asked Ferne. “That’s a lovely name - like the Christmas songs,” Ferne declared. Chocolate jumped up into Ferne’s arms. The cat wasn’t too sure about the reindeer. They were snorting and scuffing the snowy ground with their hooves. “Chocolate?” Karol laughed. “What a lovely name for a cat. I love chocolate. And we have ferns growing here in this forest.” He stood up and tied the reins to the side of the sleigh. Then he stepped down. He was very tall and thin, like a fir tree. His yellow hair reached down his back, and Ferne noticed he had a golden moustache and beard. He was wearing a dark blue tunic, which was edged with rich red and gold embroidery. He had a brown leather belt round his middle. His blue trousers were tucked into boots made of fur like the reindeers. Ferne noticed they had bells on the back like the bells on the reindeers’ harnesses. Karol tapped a larger bell on the side of his sleigh and all the reindeer turned their faces towards them. “Here we have Hop-Star, Moon-Beam, Night-Light, White-Cloud, Soft-Snow and this smaller one is called Fir-Baby.” The reindeer smiled, closed their eyes and bowed down on their front legs. Then they jumped back up setting all their bells jingling. Ferne laughed to hear the bells ringing. “I’m so pleased to meet you,” Ferne told the reindeer, “and Chocolate is too. Can I stroke your noses? Ferne noticed the seats were covered in red velvet. She stepped up into the sleigh. Chocolate followed and sat on the cushioned velvet seat close to her. Ferne tucked herself and Chocolate in with the blue and gold blanket. He shook his sleigh whip and the bells began ringing. The reindeer shook their harnesses and the echoing bells filled the night air. The birds in the fir trees woke up, chattering and singing. They took to the air with a fluttering of wings and then went back to roost. The runners of the sleigh slid effortlessly across the snow and then… the sleigh took off. They flew through the forest about a metre from the ground. They flew over an ice-covered lake. They flew past frosted trees full of glistening baubles. They flew over vast fields of snow. Then in the distance, Ferne could see a mountain of ice. It was lit by moonlight and stars. Chocolate had wriggled onto Ferne’s knee and was peering out. Her whiskers were blown back close to her face. “We’re nearly there,” shouted Karol Christmas. His golden hair streamed out behind him. He pulled twice on the reins and the reindeer slowed. They descended until their feet were stamping along the road. They finally stopped to a melody of bells. There in front of them, was the ice mountain. Now that they were closer, Ferne could see that it was carved into tiers, like the seats at the theatre. A luminous white light shone out across the snow to the sleigh. Ferne could see glowing beings dressed in white crowding every level. They had pure white, feathery wings. “Are they angels?” asked Ferne. He sat down and the angels began to sing. It was Ferne’s favourite carol, ‘In the Deep Midwinter’. The music was so beautiful, tears collected in her eyes. They rolled down her face like pearls. Chocolate pressed her face against Ferne’s cheek. At the top of the mountain she could see angels playing silver harps. As they sang and played, their wings flowed backwards and forwards. The next carol was her mother’s favourite carol, ‘Silent Night’. It was lulling both her and Chocolate to sleep. Then a tall angel stepped down from the ice steps and came towards the sleigh. His wings were folded round his body, like those of a white dove. He held a rolled sheet of paper tied with silver ribbon. He unrolled the scroll and began to read. The angels hummed a soft melody in the background. The angel smiled and walked towards her. Chocolate disappeared under the blanket. The angel handed her the rolled-up poem tied with silver ribbon. His wings furled and unfurled. A tiny silver harp landed in her lap. “He reached down and touched her head. Her eyes became heavy. The sleigh had lifted up again. “Thank you,” Ferne sighed, as she cuddled Chocolate closer. The bedroom curtains were parted and the full moon shone onto the bed. Ferne awoke. Chocolate was under her left arm, wrapped up in her scarf. Ferne was still wearing her red jumper over her pyjamas. In her lap was a rolled-up sheet of paper tied with silver ribbon from which hung a charm. Can you guess what it was? Yes, it was a tiny silver harp. Ferne plucked one of the strings then took up her pencil and notebook from her bedside table. She was going to write a special Christmas poem. And one day she was going to be a poet. This Christmas story is from my children's book 'FERNE AND CHOCOLATE AND THE ROLLERCOASTER RAINBOW AND OTHER STORIES' published by Dayglo Books @ http://www.dayglobooks.com where it tells you all about books specially for dyslexic readers and how the paper used, layout, spacing and font used (Open Dyslexic) all help children and adults with dyslexia to read more easily. (Please note the format on this website does not allow the font or spacing as seen in the books.) The books are also for anyone to read. 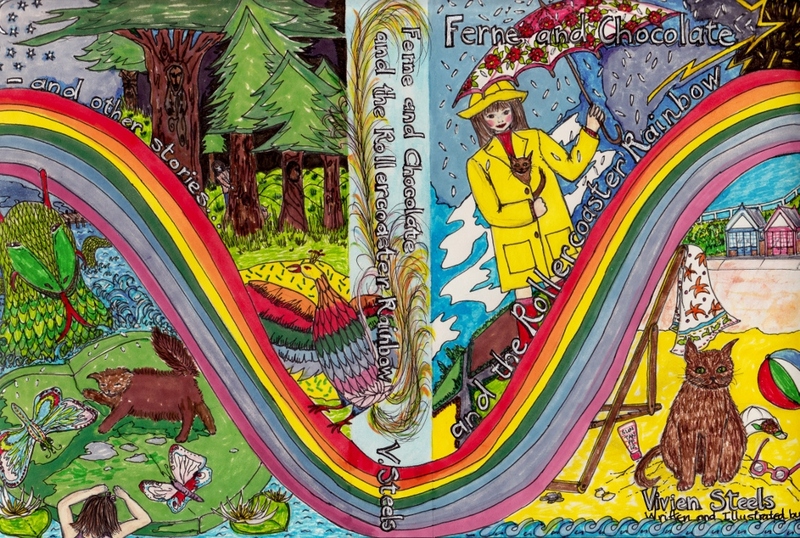 You can buy my children's book 'Ferne and Chocolate and the Rollercoaster Rainbow and Other Stories' online @ Dayglo Books http://www.dayglobooks.com/product/ferne-and-chocolate-the-roller-coaster-rainbow-other-stories/ It contains five stories each illustrated with one of my paintings. This is a picture of the complete front and back cover illustrated by me.